Fayette Pregnancy Resource Center hosted a very successful Golf 4 Life Tournament Oct. 19 at Whitewater Creek Country Club. This was the 12th annual event and 89 golfers enjoyed great competitions, prizes and meals. Highlights included a hole-in-one competition for a Yamaha golf cart, $5,000 Putt-Off challenge, closest-to-the-pin competitions, longest drive competition, bucket auctions and more. 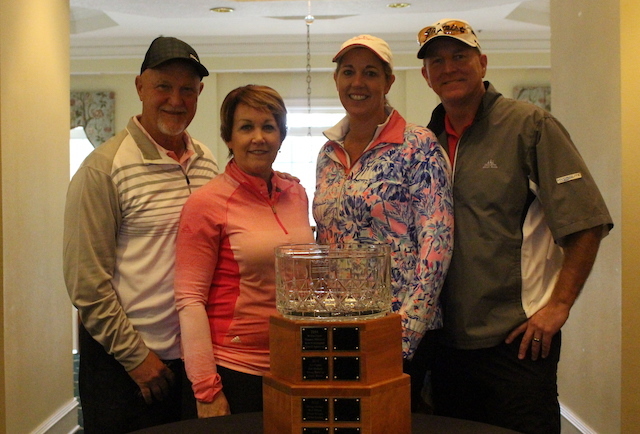 The first-place foursome was Bob Maday, Vicki Maday, Kim and Linc Larson (pictured above). They will have their names engraved on the Cooper Cup in honor of Cooper Flowers, one of the first babies scanned when the Center first offered ultrasound. The winners also received four full sets of Cobra golf grips which were donated by A to Z golf. Truett’s Luau provided food for the event. Proceeds from the event are used to support the work of the Center, a nonprofit organization that offers hope and help to families facing an unplanned pregnancy. The Center provides pregnancy testing, ultrasound, parenting/infant care classes and counseling services at no charge. For more information, visit https://fayetteprc.com/ or phone 770-719-2288.